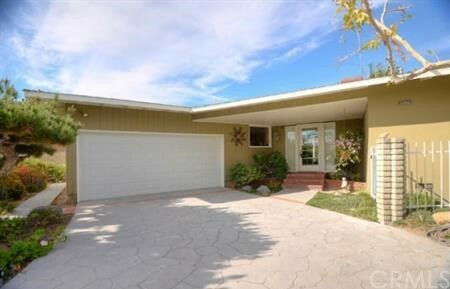 Remodeled & upgraded charming single level home on huge lot in pride of ownership neighborhood. You arrive are amazed at the expansive landscaped front yard with bonsai cut pine trees, majestic sycamore and long curved driveway. Step up onto your formal front entry to a custom front door with eteched glass. Home has been upgraded with new travertine like ceramic tile floors, new carpet in all bedrooms, and re-finished hardwood living room floor. Brick fireplace with raised harth in living room with large bank of floor to ceiling windows and slider doors. Kitchen boasts granite countertop & backsplash, new stainsteel sink and gas range and new recessed lighting. Formal dining area off kitchen and living room provides easy entertainment and flow in living areas. Bedrooms have new plush carpet, recessed lighting, wood framed windows, mini-shutters, and built-in bookcase in one bedroom. The expansive pool size and then some rear yard gives you a touch of the tropics with various palms and landscaping. The tranquil fountain off the large covered patio and living room creates a calming environment to living by and enjoy life.